It is estimated that over 40 million people watched the riveting game seven of the World Series between the Chicago Cubs and Cleveland Indians. Having grown up in Chicago and being a former peanut vendor at Wrigley Field and Comiskey Park (where the White Sox used to play) I was emotionally invested in the Cubs. And like so many other Chicagoans, I have fond memories of growing up with die hard Cubs fans in my family. In my case, however, it was not my father as he was a White Sox fan having grown up on the South Side. My grandfather and my two uncles, on the other hand, had the Cubs running through their veins. This was especially the case for my grandfather who was old enough to have remembered the 1908 World Series, the last time the Cubs had one until that historic Game 7 victory on November 2nd (technically November 3rd as the extra innings and rain delay pushed the victory passed midnight). I still have memories growing up when my grandparents would be over and the Cub game would always be on if they were playing. I can’t help but think of how happy my grandfather would have been had he still been alive. It turns out my wish for my grandfather to have seen the Cubs win is just one of millions that other Cub fans have had. I was reading about a man whose father died in 1980 at the age of 53 and while growing up his father and he made a commitment that whenever the Cubs make the World Series they would listen to the game together. The son, who is now 68 years old, honored that commitment by driving 600 miles to go to the cemetery where his father is buried in Indiana to listen to the game on the radio next to his grave. The cemetery workers made sure to keep the gates open for him to keep his commitment despite it going past the closing time. There are so many other stories like that I have read about in the aftermath of the Cubs victory. There was so much to love about this year’s World Series. No matter who won, a long, heartbreaking dry spell would come to an end as the Cleveland Indians had not won a World Series since 1948. Both teams and their managers were eminently likable, the clubs were immensely talented and they were full of young, hungry, gritty players rounded out by savvy veterans that came through in the clutch and provided much-needed leadership. World Series: The game is played by two opposing teams that have to work together and yet individuals can shine through. Actions lead to measurable outcomes (runs scored). This often brings out the best in people and shows who can make a difference in pressure-filled situations. Election: Elections are a zero-sum game and it takes money and words to garner votes. It is about securing power and influence and brings out some of the worst traits in human beings. Actions and accomplishments can be secondary. Candidates pander to their bases. I would venture to say that 99% of the people voting in this election are voting against the other person versus their candidate. while 99% of those who wanted the Cubs or Indians to win truly wanted them to win versus being against the other team. World Series: Indian manager Terry Francona was incredibly gracious in defeat. He was so proud just to have been part of something that was so historic, competitive, and magical and was extraordinarily gracious towards to the Chicago Cubs. Cubs manager Joe Maddon never gloated. He praised his team and was highly complimentary of the Indians and how hard they fought. They were two class acts. They both made each other better and required that each manager digs down deeply to keep counteracting the moves made by the other. No excuses were made by Francona and Maddon when their teams lost. The Cubs came back and won three in a row by doing what was necessary to overcome the challenge of being down 3 to 1. Both teams left everything out on the field. Election: Donald Trump and Hillary Clinton (or her surrogates) have so much terrible baggage and neither of them offers a compelling and inspiring vision for the future. It is understandably clear that they despise each other and that neither one will go down very gracefully. Well maybe they will, but they have both helped to exploit the polarization in our society that their surrogates will not and the goal of the losing party will be obstruction. It is pure unadulterated winner take all competition with no willingness to be open to cooperation. The discourse is toxic and it is clearly a zero-sum game. 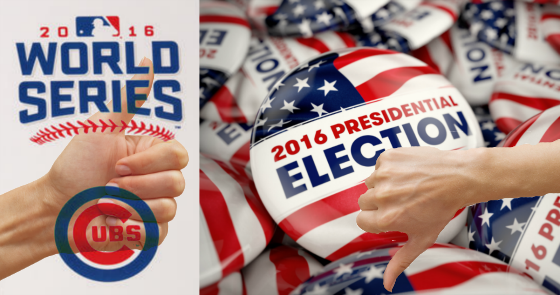 World Series: The World Series has galvanized the nation and will most likely lead to more people thinking favorably about baseball and creating more interest in the sport. Election: This process has been so ugly and disheartening that I have to expect that more people will be turned off by the political process. On the other hand, it may end up catalyzing more people to get involved but I think it’s more to help to stop the other party than to promote any positive, forward-looking, inclusive agenda. World Series: Both teams were comprised of players who were born in other countries. What is great about sports is that it is truly color blind. Organizations devote tremendous resources to find the best talent. And when it comes to all of the major sports with the exception of football, the search is global. Most baseball teams are comprised of talented players from Latin America. Performance is the greatest integrator. If these immigrant players perform they are paid well, they bond with their teammates and become more popular. Election: Immigration is such a divisive issue. One party is perceived to want to close the borders and highly restrict immigration while the other one is perceived to desire open borders in order to pander to its base and cultivate future voters. The discourse is so poisonous and the positions staked out so extreme that there seems to be very little rationality and common sense being applied. I guess this could be said about all of the pertinent issues. It seems like it is in our country’s best interest to identify critical skills that we are lacking (some of which may be lower skilled workers who are willing to do jobs that citizens are not willing to take) and devise a sensible plan to encourage and incentivize these people to immigrate to the United States. 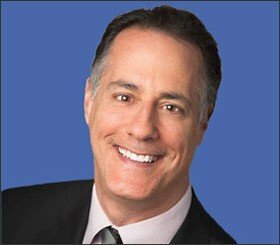 Of course, the situation is far more complex than I am making it out to be but the key takeaway is that the extreme positions of each party make it so difficult to come up with a balanced, thoughtful, long-term approach that will help the United States retain its competitiveness and global economic leadership. I am sure that there are many other comparisons I could make between the exhilarating World Series and the disgusting Presidential election but I don’t want to dwell on it anymore than I have to. Clearly, the markets are having some angst by having gone down nine days in a row, which has not happened since 1980. Those were very bad economic times back then with sky-high inflation and interest rates and terrible morale as the unemployment rate was at post-Great Depression highs. Today is very different. Valuations are quite high as a result of historically low-interest rates and inflation pushing asset values higher. The economy seems to be stuck in low gear, productivity gains are low, and the labor market is relatively healthy but nothing to write home about. What is similar, however, is the malaise. While Ronald Reagan may not have been everyone’s favorite President, there is no arguing that he was able to communicate an optimistic message and vision for the United States and helped to unleash individual initiative and creativity by lessening regulation and lowering taxes. And when this was combined with Paul Volcker helping to break the back of inflation, interest rates came down dramatically, spurring a tremendous economic boom that unleashed an 18-year bull market on Wall Street. Paul McCulley has said that there is either a bull market in capitalism or a bull market in government. Under Reagan, it was clearly the former. Under Obama, the latter has been the focus in response to the excesses of capitalism that took place during the subprime debacle of 2003-2007 and were building up before then. Now that more balance has been put back into the system, there is a titanic battle between those who believe that government intervention has gone too far and if left unchecked we’re going down the road to socialism and those who believe that we haven’t truly learned the lessons from the Great Recession, wealth is more highly concentrated, the banks and big corporations have more power and risk to the system than they did in 2007, and that globalization is a big risk to American jobs and our standard of living. This battle is creating a huge fault line in our society and exacerbating the extremes of each party and its constituents. At the end of the day, the players and managers of the Cubs and Indians were incredibly inspiring and their players and coaches were people to learn from and admire. When it comes to the two Presidential candidates, however, there is nothing inspiring and the only thing I want to learn from them is how not to be like them. With that being said, please vote and make your voice heard in your own small way. And way to go Cubs!! ‹ Dividends – Do They Really Matter? Very excellent Gary. Your comparisons are right on. Thanks for all of your well thought out blogs.